I have been waiting patiently for my ink to dry, and was finally able to lay the gold leaf without it adhering randomly to the ink. 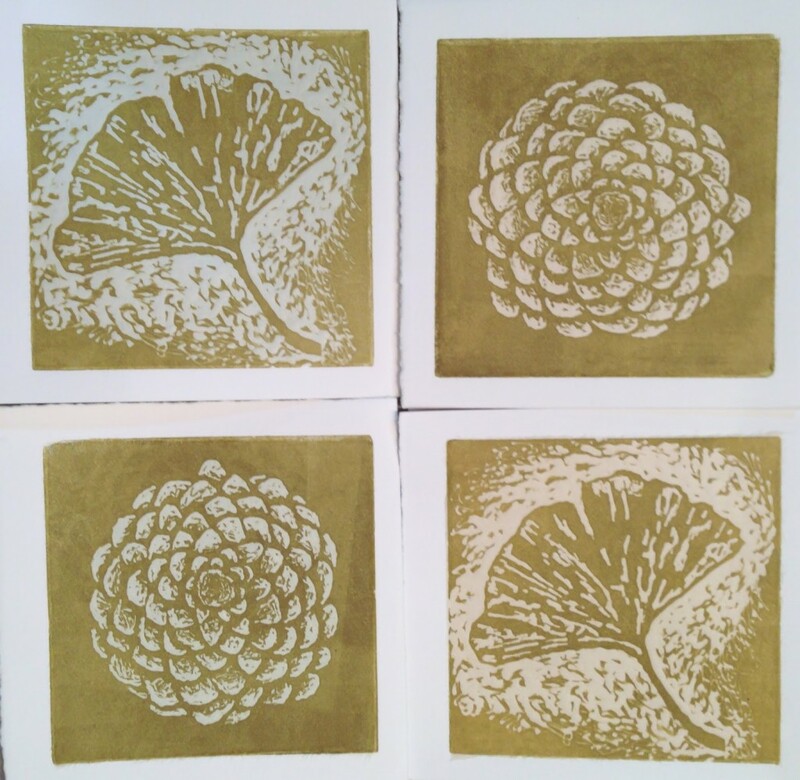 It still sticks sometimes, so I used a stencil (or frisket to my printing friends) with the gold areas cut out to protect the rest of the linocut. I like the result — warm reflected light that is different from the white of the paper or the transparent blues. 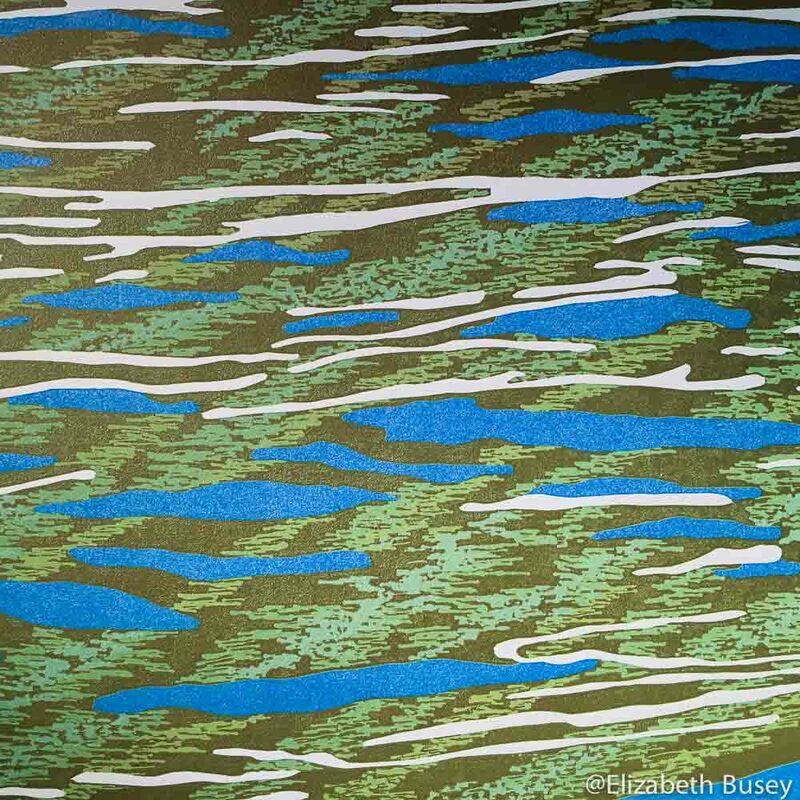 This entry was posted in Color Theory, Materials and tagged Ambrosia, Aqueous Tapestry, digital, gold leaf, Linocut, photography, presentation, reduction on January 30, 2016 by Elizabeth Busey. In every person’s professional life there are milestones. For some it is a promotion, for others a large grant or publication in a prestigious journal. For still others it is simply making a profit. For me it was seeing my work installed in a public location, complete with museum tag. Me posing with An Echo of Beginnings at the Bloomington/Monroe County Convention Center. 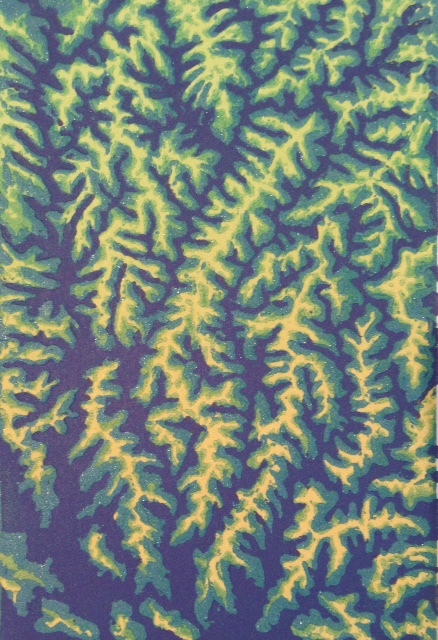 The Bloomington/Monroe County Convention Center purchased my linocut An Echo of Beginnings, after my two-month show at the center in June and July of 2015. During a visit with my daughter to the annual Artisan Guilds of Bloomington (IN) show, I spotted my work, installed and professionally labeled. A museum label accompanies my linocut at the Bloomington/Monroe County Convention Center. I’ve made plenty of labels for my own work, but seeing my name, plus “American, 1967” — why that was what they put on the labels for real artists! A bit of emotion choked me as I read this. I am so thankful (on this Thanksgiving Day in the United States) that my work can be seen by lots of visitors at the Convention Center. I feel like I have arrived. 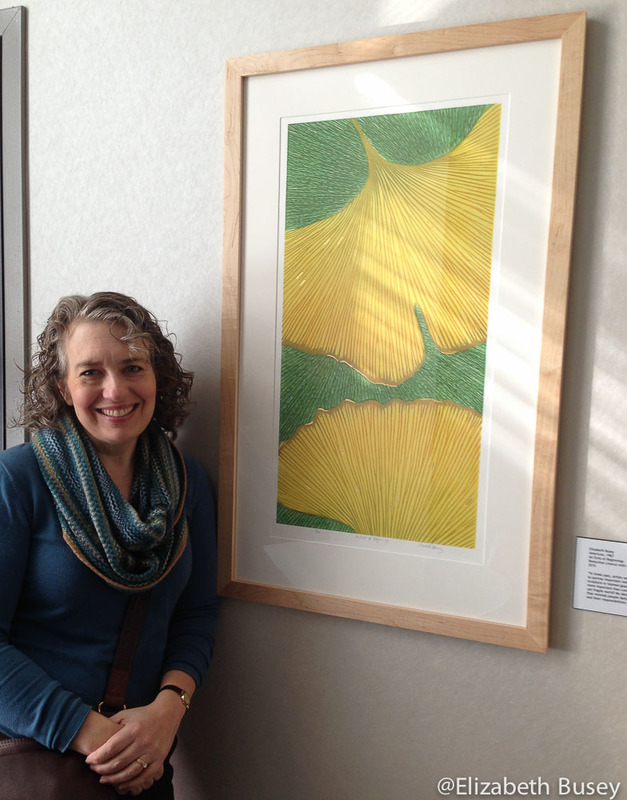 This entry was posted in Artistic Growth, Exhibits and tagged An Echo of Beginnings, Bloomington/Monroe County Convention Center, gold leaf, museum tags, reduction linocut on November 26, 2015 by Elizabeth Busey. It has been a dark winter. When I lived in Seattle, I craved sunlight so much that I would sit in our tiny Honda CRX during rainy lunchtimes on the off-chance of glimpsing some rays. Our midwestern winter has been mostly grey and overcast. Perhaps that is why I’ve been delving into the joys and trials of yellow. 18 x 18in circle, Edition of 16. 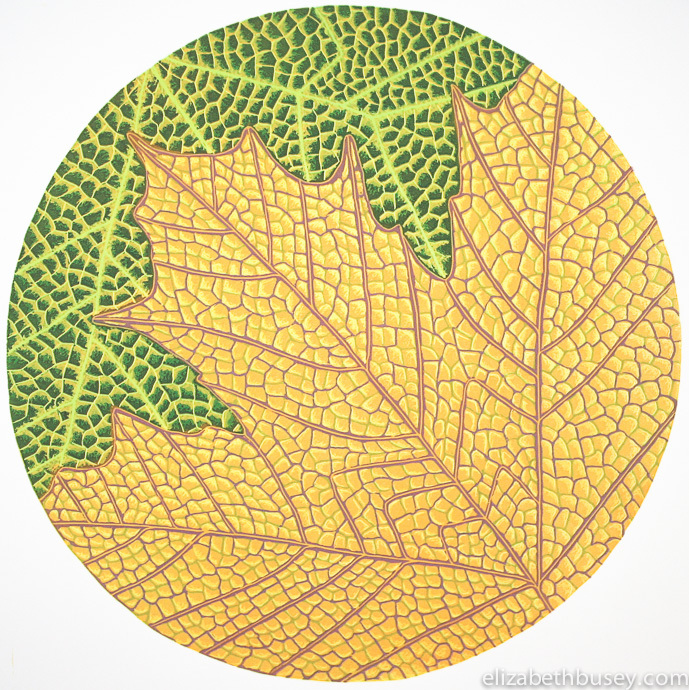 This entry was posted in Botanicals, Experimentation and tagged carotenoids, gold leaf, leaf, Linocut, Mona Lisa Extra Thick Liquid Adhesive, needle nosed applicator, printmaking, reduction linocut, sunlight, yellow on February 24, 2015 by Elizabeth Busey. In November I experiemented with chine collé, where thin papers are pasted down as part of the printmaking process. Read this post to learn more. For the actual cards, I used green and cream kitakata papers, Rives BFK as the card support, and Handschy gold ink. New Years cards for my collectors and supporters. Gold ink highlights ginkgo leaves and pine cones. 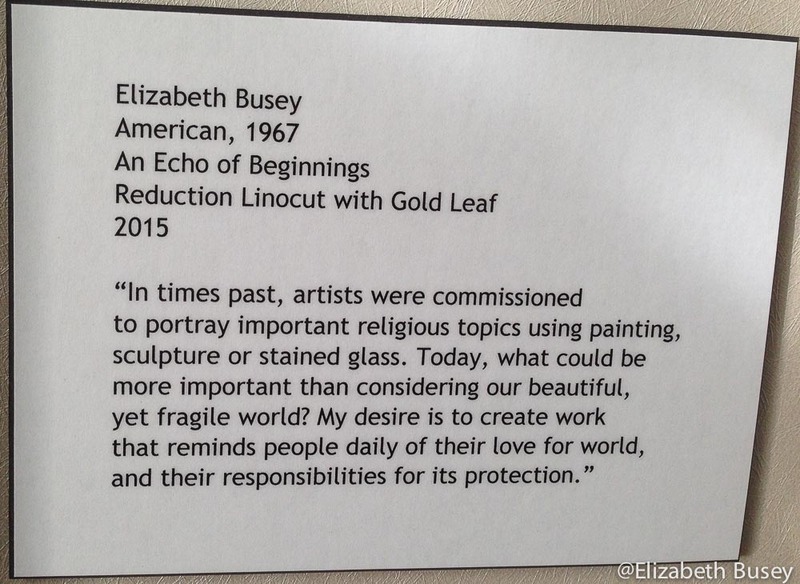 This entry was posted in Experimentation, Uncategorized and tagged Brian Shure, chine collé, gold, gold leaf, Magical Secrets about Chine Collé, patent leaf, patina, printmaking, sizing on January 22, 2015 by Elizabeth Busey. During my exploration of the sassafras leaf, I was operating under the assumption that the colors I see in the fall were always in the leaf, but became more apparent in autumn. For the yellows and oranges we see, this is basically true. But not for the red. The red that I found so challenging and unfamiliar is in fact produced by the leaves as a sort of battle against the inevitable arrival of winter. 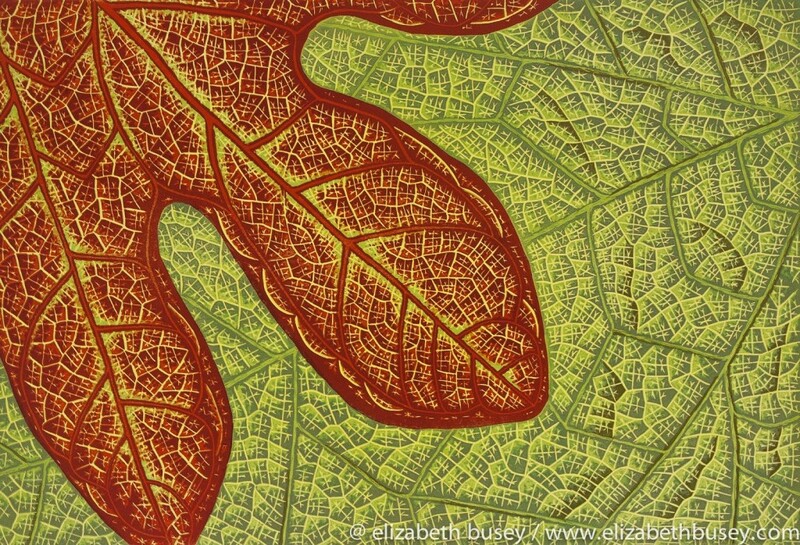 This entry was posted in Botanicals, Experimentation, Uncategorized and tagged aging, anthocyanin, autumn, fall, gold, gold leaf, gracefully, highlights, leaf, leaves, Linocut, pigment, relief printmaking, sassafras, winter, yielding on January 16, 2015 by Elizabeth Busey.